Have you noticed that seasonal spring vegetables are a theme this week? Monday I shared a recipe with peas. Tuesday it was mushrooms and radishes. Thursday it was sugar snap peas. And today I have artichokes. We ate artichokes fairly frequently when I was young. It's a lot of fun to pull the leaves off one-by-one and dip them in something like mayonnaise or lemon-butter. I wasn't really into the heart back then (I usually gave it to my mother), but now, of course, it's great. For this recent dinner, I served simply steamed artichokes alongside panko-crusted chicken. The chicken are breaded with the tried-and-true formula of first flour, second egg and lastly the panko breading, which I've mixed with a little grated parmesan. 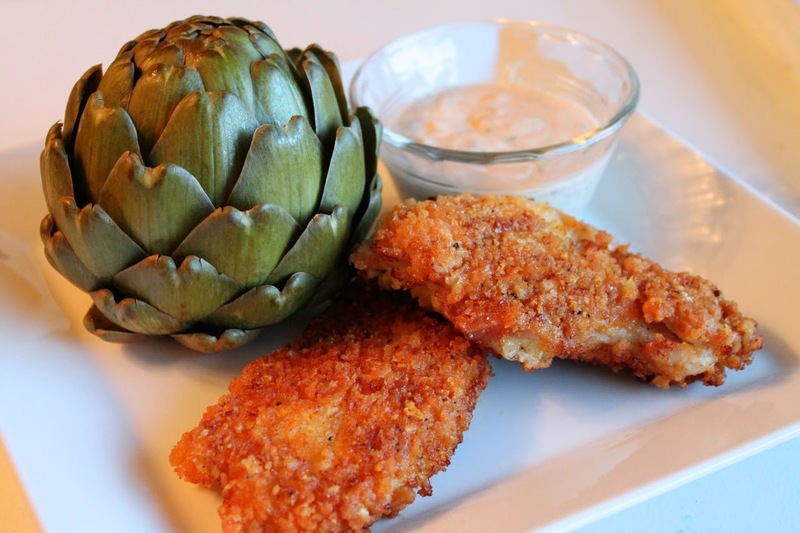 I wanted a dipping sauce that would work well with both the artichoke and the crispy chicken. Although I considered making a pan sauce, I decided that wouldn't go so well with the artichoke. Instead I mixed up this honey-mustard Greek yogurt dipping sauce, which was perfect. 1. Combine the panko, parmesan, salt and pepper. Spread on a plate. Spread the flour on a separate plate and pour the egg onto a third plate. 2. Heat oil over moderate heat in a medium frying pan. 3. Pat the chicken breast cutlets dry with a paper towel. Dredge the chicken first in the flour, then dip in the egg and finally in the panko mixture, making sure to get the chicken evenly coated. Fry the chicken in the hot oil until the breading is lightly browned and the chicken is cooked through, about 10 minutes, turning over half way. 4. Serve with the dipping sauce and artichokes. Combine garlic with a pinch of salt and grind to a paste using either a mortar and pestle or a glass measuring cup with a heavy spoon or cocktail muddler (or, alternatively, use a Garlic Twist). Transfer garlic to a small bowl and stir together with remaining ingredients. Serve in ramekins along with the chicken and artichokes. Some people cut off the top third of an artichoke or, in a process I'm sure takes a lot of time, snip the last half inch from each leaf. I don't do either of these things, as I really don't see the point. I've never injured myself while eating an artichoke. Frankly, I think you'd be more likely to stick yourself while doing all that prep. Set a steamer insert inside a large saucepan. Fill with water below the level of the steamer. Place artichokes in the pot stem end up. Cover and bring to a boil. Steam the artichokes for 25 to 30 minutes until the stem end is tender when pierced with a fork. I never ate artichoke until you introduced me to it a few years ago. I really like it, especially when you pair it with a delicious sauce like this one.